On Sunday, Dan and I had a rare date day. I say rare because we haven't had a day like this in a while thanks to me feeling like crap for the last year and a half. We used to go out and do things together like this all the time but lately, not so much. Usually because I feel sick. Well, more like ALWAYS because I feel sick. But yesterday was different. Yesterday we got out and enjoyed the day! It started with church and then lunch at Subway with friends. It was lots of fun, especially since we also never eat out anymore. I know Subway isn't overly exciting but for me, it was. After lunch we headed off to a hockey game! A friend of Dan's has an 11 year old son who plays on a local hockey team. Earlier this year they were looking for sponsors and Dan signed up. So as a support, we thought we would go to some of his games. Yesterday was our first one and it was so much fun! I was fully prepared to not enjoy myself but was pleasantly surprised. First off, kids hockey games are shorter so that was a plus. 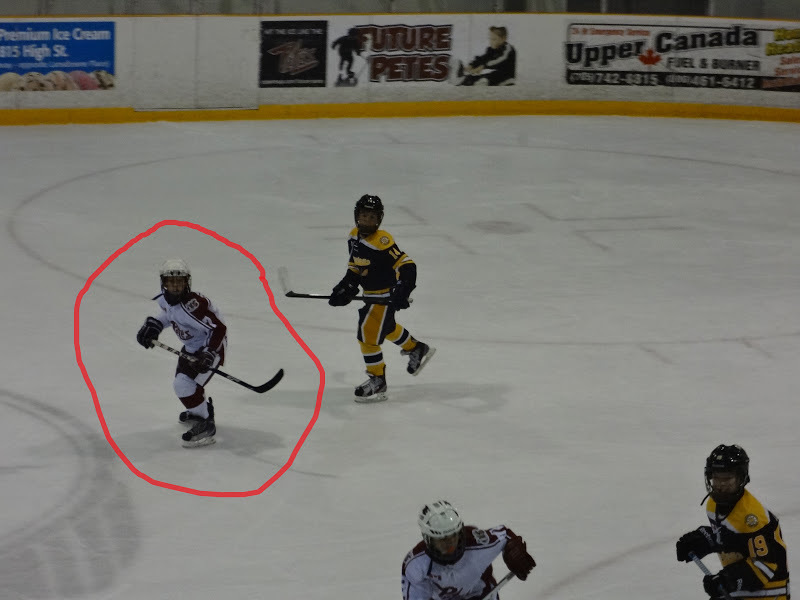 And second, kids playing hockey is so dang cute! They spent so much time on their knees and falling over. There's the kid we cheer for! But it was a good game and our team didn't lose. They didn't win either though, no goals were scored. Oh well, there's always next time! And we will for sure be going to more games. It's a fun Sunday afternoon activity to do together. After the game we headed out for some geocaching and to get rid of the "Travel Bug" we picked up from the cache in Ottawa. We headed to the biggest local tourist attraction in our city, the Peterborough Liftlocks. It was such a gorgeous afternoon, even if it was a bit chilly. We just bundled up and enjoyed the sunshine! Bundled and ready to geocache! We parked by the canal and then walked up to the top of the locks. Fortunately we were on the right side so all we had to do was walk up a ton of stairs and cross the road. Pretty simple right? We even found the cache really easily! Unfortunately, we realized that we forgot to bring a pen with us and we couldn't write our names in the log book. Which just won't do. So we had to go all the way back to the truck to get a pen. I stopped along the way to take some more pictures though, before the sun disappeared. Once back to the truck and with pen in hand, we voted for driving up to the top of the locks in order to save us some time and energy. The only bad part of this plan was that we were now on the wrong side of the river. Dan wasn't at all concerned because we could just cross using the "walkway" or as I call it, "the death trap". I guess for you to fully understand, I'd have to tell you that I'm terrified of heights. Terrified. The thought of crossing it is making my heart beat faster and my hands get all sweaty right now. :::shiver:::: Back to Sunday, when we came up to the "walkway" my legs got all weak and shaky and I seriously wasn't sure if I could take another step. But I did it! Barely and very very slowly with breath held. Dan was even nice enough to take this picture for me to give you an idea of what I just did. It doesn't look as scary in this picture for some reason. But on one side there is a huge drop off and then on the other there is a basin that is supposed to have water in it. It doesn't. So basically, if I fell off either side I'd die. Well, maybe only the one side. The other side would probably just hurt. But I had to cross two of these! Back to the story. We had our pen so we went and opened the cache. We left our mark and left the Travel Bug. Be free little Bug and travel far and wide! That concludes our date day. It was a lot of fun and I was in such a good mood. Getting out and about sure does improve life! Oh, and in case you're wondering, I didn't cross the death trap again. I told Dan I'd meet him at the bottom and I used the stairs. I just couldn't do it. Aww, the little Petes! My cousin plays on the baby Petes team, he's 7 (uuhh.. I had to think about that!). Love it!